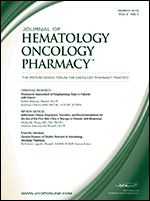 Most patients with cancer have multiple comorbidities and are at high risk of polypharmacy. In addition, reviews have shown that up to 33% of ambulatory patients with cancer are at risk of drug–drug interactions. In 2011, the first anticytotoxic T-lymphocyte antigen (CTLA)-4 therapy ipilimumab was approved by the US Food and Drug Administration for the treatment of patients with unresectable or metastatic melanoma based on a demonstrated overall survival benefit with this agent in phase 3 clinical trials. My student and I have read the above article with much interest. It has led to much research this afternoon and reading of the American College of Chest Physicians (ACCP) 2012 guidelines for confirmation of some of the statements within the article. We would like to point out 2 items. Metastatic castration-resistant prostate cancer (CRPC) is associated with rapid deterioration and leads to mortality within 2 to 4 years. The treatment options available for patients who have not received chemotherapy have been proved to produce response in these patients, but new options are needed that could lead to tumor regression or prolong life. Previous studies have shown that the use of abiraterone plus low-dose prednisone in patients with CRPC who have received chemotherapy improves survival; this combination was subsequently approved by the US Food and Drug Administration for this patient population. Early-phase clinical trials in patients with CRPC who have not received chemotherapy have shown increased response rates with this combination.